Congrats to the Tar Heels. Sometimes the hardest thing to do—even when you have the talent and skill—is to fulfill everyone's expectations. Here comes the self-important sports reporting item of the week. Apparently some Jet beat reporter is upset that coach Rex Ryan is taking advantage of his first Jet's mini-camp in upstate New York, away from the reporters. The writer tries to dress it up and say that the real issue isn't that he's isolating the players in their mini-camp, but that in these hard economic times, Ryan should use his expensive new facility right in Jersey because—its wasteful not to. Riiiight. Ryan shouldn't try to build team unity—he should try not to be wasteful. Please. The only reason this report wrote this silliness is because Ryan is keeping the reporters away from his guys for a spring mini-camp. So stop trying to dress this up as an economic issue and pouting because you can't write yet another "Jets should gotten Jay Cutler" article. So, Gary Sheffield is a Met. Can't wait to see how long the honeymoon lasts in Queens. Great analysis from the guys over at www.mlbtraderumors.com. Simply by adding Xavier Nady in right field and Mark Texiera at 1st, the Yankees are projected to save 40 runs off their ERA. 40 runs!!! Last year, the Yankees gave up 686 runs in 1441.2 innings pitched, which added up to a 4.28 ERA. Take away 40 runs off that, and the Yankees team ERA drops to a 4.03, good for 6th in the AL, just 2 hundreths of a point behind Boston. Interesting stuff to speculate on. I'm sorry. I don't care if the Lions are allowed to pass on their pick in the draft; they won't. Could you imagine what what's left of the Lion fan base would do if the Lions perpetrated the idiocy of passing on their pick to save a few shekels? Pitchforks and torches wouldn't suffice. "So what's the problem? No biggie. Just an understanding that by opening something this large, self-congratulatory and expensive, particularly at a time when so many people are suffering..."
Please understand...this Stadium was started during an economic boom. And times changed. So what do you suggest the Yankees do? Play in a small schoolyard? Stop building the Stadium the second hard times hit, despite the fact that it was being planned for a decade? The Yankees have dropped ticket prices on a lot of seats and are aware of the hard times—as is every franchise in sports—but at least keep the bashing of them to a reasonable level. And not the dunderheaded thinking represented here. 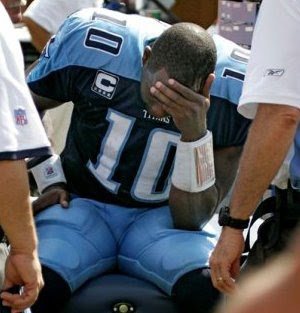 Can anyone tell me what ever happened to Vince Young? I mean, wasn't he the NFL Rookie of the Year? Get this. The Seattle Mariners, after wining their Opening Day game, went into the clubhouse and had a beer shower celebration. “The guys are in there celebrating our first win,” new manager Don Wakamatsu said. Guys, it's one win. There's 161 other games to play. And finally, sad news. Bob Sheppard, the Voice of God and of Yankee Stadium wasn't able to call the first game at the new Stadium. The Yankees announcer for 58 years—his first game was April 17, 1951— Sheppard was too ill to call the game and is hoping to recuperate enough so that he can resume his duties sometime this summer. A good guy and a class act, we wish him well. It won't be the game without Sheppard's voice in the Stadium.